As a previous Big 4 alum alum, founder Nicholas Hansen would like to offer KPMG employees a free custom shirt with custom suit purchase, or 15% off custom clothing packages. Simply mention 'KPMG' in your appointment request and bring proof of KPMG employment to your appointment. Valid for new orders only. *Effective 3/8/19. Cannot be combined with other offers, promotions, or discounts. New orders only with proper KPMG employment identification. Bold accessories to match his summer style. Dad always needs a new belt, right? Additionally, our clients have also been raving about the new Saxx underwear line, save 15% on 4 or more pairs. Gift certificates in any amount so he can customize his gift. Purchase in-store, online or over the phone for the lucky recipient. Gift Certificates can be emailed or sent via mail. 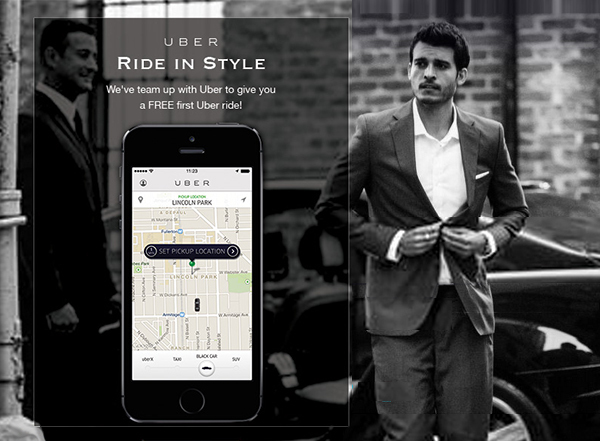 We've teamed up with Uber to give you a free* ride in style to our showroom. New Uber users can get a free ride, up to $25, to Nicholas Joseph simply by signing up and using the promo code below. Tap a button, get picked up in minutes! DiPrima jacketings are woven in Italy especially for our mill and bear the unmistakable Italian imprint of flawless taste. 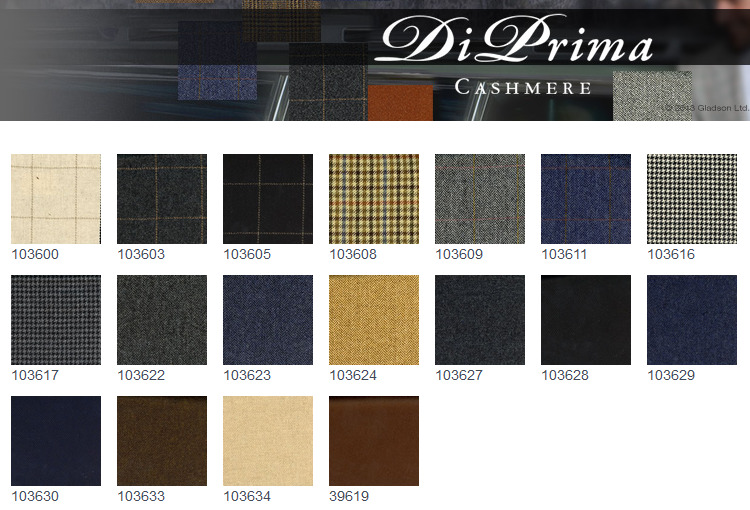 DiPrima is our mill's signature Cashmere sport jacketing range. A magnificent cloth woven in Biella, Italy. Now in its third rendition, DiPrima is replete with innovative patterns and colors that push the envelope but remain within the realm of good taste. DiPrima ... the ultimate jacket. Stop in to see and touch these fine fabrics. On sale for $1495, reg. 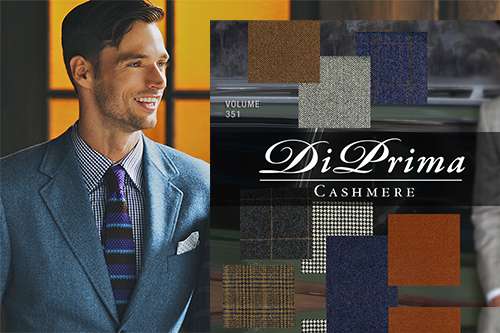 $1995 in custom sport coat, while supplies last, from DiPrima Volume 351 book only, pricing valid for new orders only. In celebration of our 10th year in business, Nicholas Joseph is proud to launch Made in Chicago bespoke clothing with a 3 week delivery, suits start at $2995. Our bespoke suits are hand cut and hand made by Chicago's best tailors with decades of experience (think Oxxford and Hartmarx skill), come with a basted fitting, and patterns are kept on file for fast repeat deliveries. Stop in to learn more about the luxury of this new bespoke clothing line. Made in Chicago Bespoke Suits, from $2995 and three week delivery. Client availability, special order fabrics, and peak season may affect delivery times. 2014 is Here, Focus on You. You've made it through the holidays and it's time to focus on you. Like it or not, it's true. Custom clothing will ensure that you make the best impression possible, and the ROI of custom clothing is huge, just ask any of our clients next time you're in the Showroom. Get the perfect fitted items for a cohesive wardrobe for all occasions. Most guys don't know that we make custom suits and custom shirts for the same cost, or less, than a designer suit off rack. 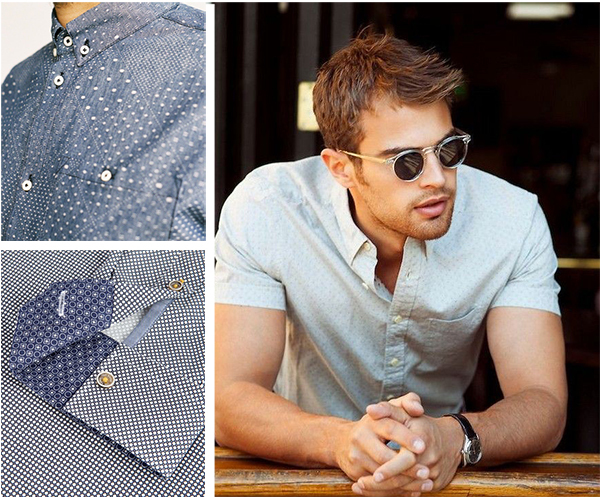 We even include the same designer fabrics like Zegna, Loro Piana, and others. A designer label from the fabric mill is handsewn into the inside of the jacket as well. Take advantage of 15% savings when purchasing a custom clothing package, as most of our clients do. Our experienced Designers and Master Tailor will work to give you the look and fit you want for perfect lasting impressions in 2014 and beyond. Whether you need to get noticed wearing a handmade custom suit in Chicago's Loop, or close a real estate deal wearing a bespoke custom suit in the North Shore, Nicholas Joseph has you covered. We're located street-level, right in Chicago's River North neighborhood with a full block of flashing light parking in front. 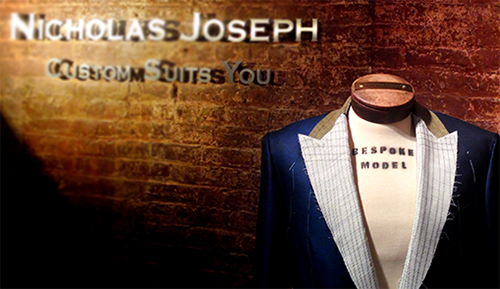 Ask about our new Made in Chicago Bespoke Suit, delivered in just 3 weeks, starting at $2995. Gifts: Asked for Your Gift Ideas? Custom Clothing, Of Course! Cashmere Top Coat: Look around, most guys don't have a sharp top coat. In pure cashmere this top coat will dress you up and still can be worn on the weekend, you need it. We also carry fine men's accessories like custom cuff links, custom belts, Fulton Umbrellas, cashmere lined Dent's gloves, and more. or...Gift Certificates in any amount - buy them online. To kick off Fall, Chicago's well-dressed men gathered at our Showroom in River North to celebrate the Ermenegildo Zegna Autumn Winter 2013/14 Collection with a Trunk Show and savings of 15% on Zegna custom clothing. Chicago tie designer, Lee Allison's Fall collection was also featured. Recognized around the world as one of Italy's luxury menswear brands, Zegna Cloth represents the crossroads of innovation and style. The Zenga trunk show sale included fabrics from the Zegna Traveller, Trofeo, and Trofeo 600 collections. The Zegna Trofeo collection is a contemporary designed collection of 7 ½ ounce cloths with the perfect finish and drape - the ideal business traveler suit. This exclusive cocktail reception was the highlight of the Trunk Show week and held for clients to learn more about Zegna clothing paired with Lee Allison ties, and enjoy the Macallan vs. Highland Park scotch tasting. Tie pairing, knotting, and pocket square folding was also demonstrated. Subscribe (top of this page) to Hear about Events and Promotions.